Unlike massage oils used in the West, Ayurvedic oils are specially crafted medicinal substances that can be used both internally and external. My personal favorite is Kapha oil to help with circulation and lymphatic flow. Padmashri oils are the high quality Ayurvedic oils prepared according to authentic Ayurvedic practices. Use the discount code 'Manjiri10' to get 10% OFF your order. Sewanti Ayurvedic multi-ingredient classical formulations are some of the first in Canada to be approved by Natural Health Product Directorate of Health Canada for safety, efficacy and quality. 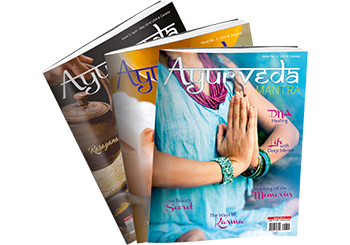 Ayurved Mantra Magazine is one-of-a-kind Ayurvedic Magazine that boasts of insightful articles by experts on Ayurveda, yoga, higher awareness and natural wellbeing. Manjiri highly recommends Ayumantra Ayurvedic Products, which are made by sourcing the best native grown herbs during the harvest season, followed by final production in Canada to meet the North American Standards. P.S. I'm an affiliate for a few of the products above, meaning if you click through the links below and eventually purchase them, I make a small commission. However, know that I'd wholeheartedly recommend those products whether I was making anything or not. I have personally tried these products and trust their quality as well as efficacy. And I am truly grateful for supporting these wonderful Canadian Companies.